For more tutorials, news, and project ideas, stay up to date on Electromaker.io! The Raspberry Pi is a versatile single-board computer. Its popularity stems from massive operating system support, community resources, and a bevy of applications. Though it often seems as though the majority of users are running RetroPie, Recalbox, or Lakka on the Raspberry Pi for retro gaming, it's a capable device for tons of applications. You can create a media or file server with a Raspberry Pi for file access virtually anywhere. 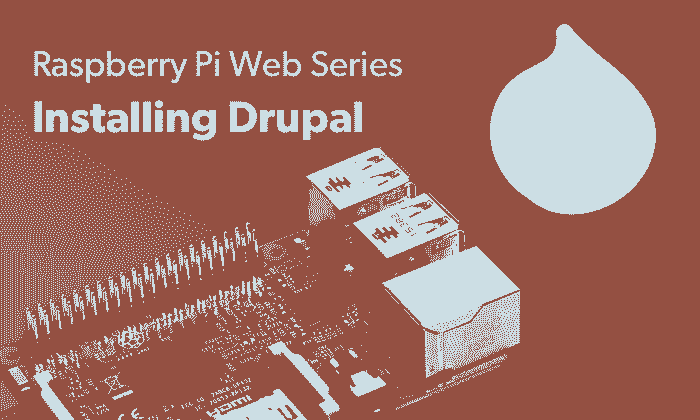 Additionally, you can make your own Raspberry web server with Drupal. Learn how to install Drupal on Raspberry Pi boards! Drupal on Raspberry Pi: What is Drupal? Drupal is a free and open-source content management system (CMS). It's written in PHP and available freely and legally under the GNU General Public License. Because of its open-source nature, hefty feature set, and lots of community support, Drupal is a popular content management framework. It's touted as both highly-scalable and flexible. Like Wordpress, Drupal boasts tons of resources including themes, forums, and more. Notably, Drupal features excellent security features, with sites such as WhiteHouse.gov using Drupal. First, you'll need a Raspberry Pi board. A Raspberry Pi 2, Raspberry Pi 3, or Raspberry Pi 3 B+ works best. Additionally, a Raspberry Pi Drupal install requires a power supply, microSD card, a Linux-based operating system (OS), and optional case. Plus, peripherals such as a keyboard and mouse. A Raspberry Pi runs about $35 for just the board. There are tons of neat Raspberry Pi cases you can buy for protecting your Pi board. Chances are you likely have a microSD card lying around and probably a compatible micro USB cable to use as a power supply. You can pick up a complete kit for around $40 or more. Drupal Pi is an easy means to add Drupal to the Raspberry Pi for a web server. As its GitHub page explains, this is a derivative of the Raspberry Pi Dramble project which provides the functionality to make a Drupal cluster installation on Raspberry Pi devices. This, however, is intended for a solitary Raspberry Pi running Drupal. Wait a few minutes, then open http://www.drupalpi.test/ which should yield the appropriate test page. From here, pick an installation profile. You can opt for minimal or standard. Click save and continue. Pick a language, then continue. Now, you'll need to wait for some basic installation to complete. After that finishes, configure your site. You'll need to enter a site name and email address, as well as username, site maintenance email address, password, as well as enter server settings. This includes picking a default country, time zone, and choosing your update notifications settings. When you finish, click save and continue. Now, you'll have a link to visit your website. Running Drupal on a Raspberry Pi is pretty simple. You've got a few methods for installing Drupal, including a command line installation of Drupal 7 as well as Drupal Pi. You'll find Raspberry Pi Drupal performance fine for a basic site, but it's not ideal for running a comprehensive web server. I was pleasantly surprised that installing Drupal on a Raspberry Pi 2 worked reasonably well. A Raspberry Pi 3 or Raspberry Pi 3 B+ will yield the best performance, but you can absolutely get Drupal running on a Raspberry Pi 2. Running a Drupal web server off of a Raspberry Pi provides an easy, low-cost means of making a web server. If you'd rather create a cluster, check out Dramble which allows you to create a cluster of Pis running Drupal. More powerful hardware is definitely preferred. For instance, I won't be switching my personal website over to a self-hosted site on a Raspberry Pi. But for something basic, or to learn about web servers, installing Drupal on the Raspberry Pi offers a fun, simple project idea. Opting for a cluster set up provides greater Drupal performance on a Raspberry Pi. What servers are you running on your Raspberry Pi?